Here are a few of my favorite sailboats. I wouldn't cruise the seven seas in all of them or enter all of them in the Chicago/Mackinaw sailboat race. They each have their good points (and bad points). Don't forget, my opinion on these boats is just that, my own opinion. I wouldn't sail around the world in a Catalina 27 but many sailors have. At least one person has actually singlehanded a Catalina 27 around the world. My reply to this: "several people have gone over Niagara Falls in a barrel but I'm not going to do it." That same person that went over the falls in a barrel will probably single hand a Catalina 27 around the world. I place the comfort rate in both about the same. Actually, here in the Great Lakes, I enjoy a 27 foot sailboat. I've owned a couple of 27s and sailed them thousands of miles here on Lake Erie and Lake Huron. I owned a 1974 Catalina 27 for about 10 years, traded it for a new Irwin Citation 34 (my first and only new boat), and now sail a 1974 Cal 2-27. Carl Alberg's designs, Pearson 30, Crealock 34, Irwin Citation 34, Bruce Roberts 34, Crealock 37, Catalina 27, Cal 2-27, Catalina 30, Bob Perry's Valiant 40. More boat profiles and drawings will follow. I would like to start a Cal Yachts page (Homepage for older Cal Yacht sailors will be here by March 15, 1998). which will include as much as I can find on the older Cals. Cal seems to get a raw deal on the net. There are thousands of sites for Catalina, Hunter and the rest of the mid range boats but it's hard to find much about the Cals. The Bill Lapworth designed Cal 40 was a great leap forward in boat design, won thousands of races and titles. Catalina, Hunter, Cal, Pearson Yachts and designers like Frank Butler, Bill Shaw and Bill Lapworth brought sailing to the masses. They also started the development of the fast, pretty (and very seaworthy) sailboats of today. If anyone has any information, brochures or specs on any of the old Cal Yachts, please FAX or mail them to me and I'll try to include them in my new Cal Yachts webpage. Address & FAX # at bottom of this page. As you might see, I've always owned low to mid price ranged boats. "Chevys" you might say. My wife Karen and I have sailed many thousands of miles in these mid priced boats. More than 95% of our sailing has been in Lake Erie which is a fresh-water lake about 250 miles long and 70 miles wide so it doesn't offer the huge waves and winds that mid-ocean does. Also good trained assistance is usually just a cell-phone call away (if you should happen to need it). Pictured at left is a line drawing of an Alberg 30, a typical Carl Alberg design. 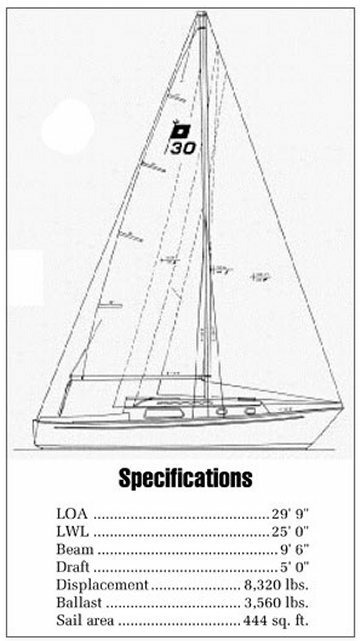 Pearson Yachts produced the first production fiberglass sailboats. The fiberglass Pearsons were designed by Carl Alberg. They sold well and made Pearson the #1 sailboat producer in the world for many years. Click here for my humble views on Alberg designs. Click here for my views on Catalina 27s and 30s. These were two of my favorite sailboats. However, there were actually three of them. The Catalina 27 has had a major re-design since it was first introduced in 1971. The original 27 ceased production in 1991. Total production was 6662 hulls. The current model, the Catalina 270, debued in the fall of 1992. This is why the Catalina 27 is not the longest production run of any sailboat over 25 feet in length over all (LOA). I was forced to reduce the size of this page, since many users with slower modems couldn't load it. So click above for my views on these 3 sailboats. The Cal 2-27 was designed by Bill Lapworth. The boat was a major competitor to Frank Butler and his Catalina 27s during the 70s and 80s. Actually, I think that the Cal 2-27 is a little faster than the Catalina 27, having a taller stick, more sail, a harder turn at the bilges and a slightly flatter bottom. The Cal's interior was not as nice as the Catalina. Frank Butler, of Catalina, seemed more concerned with the creature comforts of the interior and exterior of his 27 while Bill Lapworth seemed more concerned with the performance end of sailing. People seem to buy boats more for the creature-comforts. Note that Catalina Yachts is alive and well while Cal Yachts is gone... I've owned both boats, crewed on both. Matter of fact, I own a 1974 Cal 2-27 right now. Here's some things I like better on the Cal. The lead keel was bolted directly to the bottom of the hull on the Catalina but Lapworth includes a fiberglass skeg (about 14 inches) into the bottom of his hull and bolts the external lead ballast on the the bottom of the skeg. This puts the ballast weight much lower in the Cal. The turn at the bilges is a bit harder on the Cal, making it initially stiffer and providing more interior room at the cabin sole. Here are the specs for the Cal 2-27. Draft (fin keel) = 4' 6"
I=36', J=12', P=30' 8", E=12' 3"
I don't display a line drawing here of the Cal 2-27, since I included several 2-27 line drawings in my "Sailing Old Cal Yachts" page . 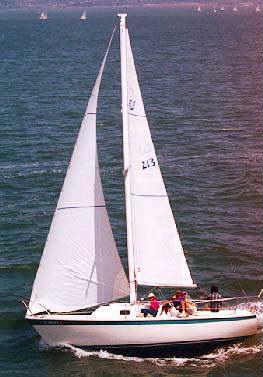 The Cal is larger and heavier than the Pearson 26 and the keel and rudder are not swept back as much. 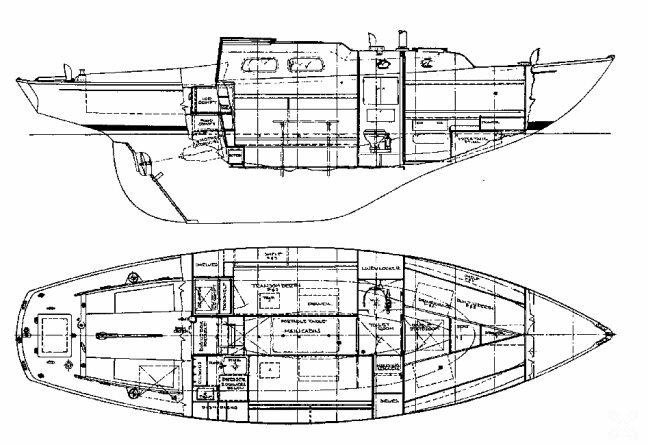 Line drawings of the Cal 2-27 as well as several photos of my 2-27 "imp" can be seen on my Cal 2-27 page. The 2-27 page can be accessed from my Cal Yachts webpage in the links near the bottom of the page. I've owned only 6 sailboats. I started sailing during the early '70's with a used 14 foot Ray Green Rascal, then a McGregor Venture 21, then bought a used 1974 Catalina 27, sailed the Catalina for 9 or 10 years, bought a new 1983 Irwin Citation 34. I sold the 34 in 1989 and bought a used 1974 Cal 2-27. For my sailing in Lake Erie and Lake Huron, I liked the 27 foot length. A 27 is easy to maintain, has enough sail area to sail well but the sails aren't too large for one person to handle. Not that I enjoy single handing, I mostly sail with my wife but generally she has the helm and I do the sails. Even though I like a 27 for ease of maintenance, I'm now in the process of building a Bruce Roberts 35A from mild steel. As far as sailing, I like the Cal better than the Catalina. The '74 Catalina had a much nicer interior, however. Catalina Yachts redesigned the 27 sometime between 1974 and 1996. It's interesting how they leaned toward the Lapworth designed Cal 27 in this redesign. They increased the beam, draft and waterline length. They also lightened the boat like all the builders of today's era. Myself, I don't mind the extra hull weight. I cruise mostly and usually have the boat loaded fairly heavy anyhow. The Pearson 30 was a true big brother to the 26. This model was produced by Pearson Yachts for about 9 years, from 1971 to 1980. Vessel Walk Through . . . Starting forward there is a chain locker followed by a large v-berth. Next aft is the head to port and the sink for the head to starboard. Next aft is the main salon with settees to starboard and port. On the port bulkhead is a fold up table which drops down to make a very nice dinette. Next aft to starboard is the galley area with counter and sink with an icebox. Across from the galley is a comfortable port quarter berth.Cockpit cushions were standard equipment. These Pearsons, both the 26 and the 30, are small, by today's standards. The actual size of this 30 footer is not much larger than the new style Catalina 27 (page up for specs on the Catalina 27). However, the hull weight and the weight of the ballast is heavier in these old Pearsons. Myself, I'll still take the layer after layer of heavy fiberglass over the new, high tech, lightweight layups. Ballast = 3560 pounds external lead, Bridge clearance = 42' 4"
Practical Sailor called this boat "a successful design that's good for both club racing and short-term cruising. A good investment." We agree. The 30 came with a Universal Atomic 4 gasoline inboard as and a full equipped galley as standard equipment. These old Pearsons were built like Sherman Tanks. They're a good, inexpensive purchase for first-time sailors. 1973 to 1978 Pearson 30s can be purchased on today's (May 2010) used boat market from about $7000 to $15000. A used Catalina 27 (1996 - 2010) is running from about $35,000 to $55,000. As with all purchases of used sailboats, a good marine survey is recommended. Pacific Seacraft builds a top of the line craft. The glass hulls are sometimes several inches thick under the waterline. Interiors are beautiful and immaculate. The long overhangs don't help it conform to any racing rules but she'll ride better in a heavy chop. This boat is my #1 choice in a "cruise the world" sailboat but, to tell the truth, I can't afford one. If I could, I would have one... Note that this boat is 2000 pounds heavier than my Irwin Citation 34 even though it's over a foot narrower and more than a foot shorter on the waterline. Again, I'll take the extra weight! In all fairness, my Irwin would probably whip this Crealock, boat for boat, in most any weather but as I near the 60 year mark, this doesn't seem as important as it did 30 years ago. A 20 foot Sea Ray would whip 'em both! LWL: 26 ft. 3 in. Sail Area: Sloop 534 sq. ft. The line drawing of this Crealock 34 is very similar to the line drawing of the Crealock 37 below. Only the specs differ. Length: 36 ft. 11 in. LOA ,27 ft. 9 in. LWL, Beam: 10 ft. 10 in. Draft: 5 ft. 4 in., Displacement: 16,000 lbs. Sail area: Sloop 619 sq. ft.
Sloop Main, 272 sq. ft.. 100% foretriangle, 347 sq. ft.
Engine: 32 HP, Fuel: Diesel, 47 gals. This sailboat may be seen in either sloop, cutter, or yawl, so hull shape is important for identification. It has a very distinctive stern. Long spoon bow with chin. Two-and-three porthole layouts are also available. Underwater lines show a very normal fin keel, but the canoe stern is unusual. The cutter rig shown does not indicate staysails. Maximum beam is aft. Below, the main saloon appears spacious. A double berth is to starboard, a single to port. There is unusual storage in the fo'c'sle, with five drawers, a hanging locker, and a vanity to port, and three drawers under the double berth. The head has a grating over the shower drain. Aft is a navigation station, seat, and double quarter berth. The galley is to starboard and has three burners, a double sink, top-loaded refrigerator, and oven. The cockpit has three seat lockers, and there is a transom locker. Two skylights are over the forecabin and the saloon. A short jib track, a traveler, and three winches are mounted on the coach roof. A genoa track is mounted on deck inboard, with leads to two primary cockpit winches. There is pedestal-wheel steering. I owned a 1983 Irwin Citation 34 for 6 years. The boat was a shoal draft, centerboard model. The boat sailed decently and had a beautiful interior. The first year that I owned the boat, I was beating back to Port Clinton, Ohio from Scudder's Wharf on Pelee Island. This trip is about 30 miles as the crow flies. We were hard on the wind, leeward rail kissing the water, centerboard down, pounding hard against the famous 4 and 5 foot Lake Erie chop when my wife called from below. "Come down here, it sounds like this boat is breaking apart!" I went below and noticed the hull was oilcanning (hull flexing) badly to the point that the flexing had torn the cabin sole loose. I had sailed my 1974 Catalina 27 in the same conditions and never heard noises like this. I went topside, reduced sail to ease the pounding. We continued our trip to Port Clinton and arrived safely. An inspection after our arrival showed that most of the stainless steel screws that held the 3/4 inch plywood sole in place had been torn loose from the hull's structural framework system. I called Irwin Yachts and talked to an employee who told me that the flexing was normal and to refasten the cabin sole with a size larger screws. He said that the complete hull/structural framework/sole assembly were built of high tech plastics and were strong only as a unit. I refastened the sole as he told me but also doubled the number of screws. I never had any more trouble but always worried about the boat's hull strength. I never pushed the boat hard after that. I sold her in 1989. I've said this before and I'll say it again. "Maybe "high tech" is OK but give me the old, heavy, layer after layer of glass matt and roving." It makes for a heavier boat but sure does make me feel better. I've heard stories about other designs (good, expensive designs) that would oilcan in certain conditions. Perhaps I worry too much... My Irwin never let me down, always sailed well, but that beat back from Pelee always stayed on my mind. Length: 34 ft. 7 in. LWL: 27 ft. 4 in. Sail area: 582 Sq. ft. I included the Irwin here because Karen and I did like the boat. It was a little tender but sailed very well. The Yanmar 3 cylinder diesel always performed perfectly. The helm was easy to handle even in strong blows. The galley and the interior were beautiful. We enjoyed the shallow draft and the centerboard really helped on the windward legs. When pushing the boat to windward, weather helm could be reduced quickly by simply cranking the centerboard up about halfway, moving the keel's lifting effort aft (also letting the boat slide a little more). This always kept Karen happy on the helm until I could shorten up the main. After a reef or two were tucked into the main, the centerboard could be lowered fully again. Valiant 40 by Robert Perry. 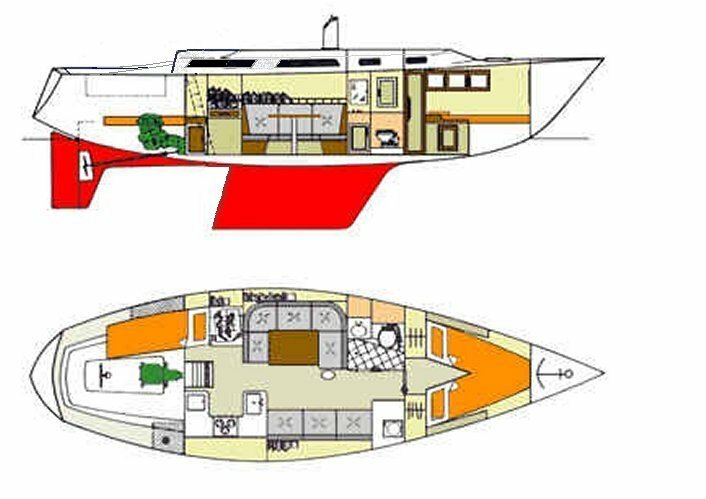 The Valiant 40 was the first boat designed by naval architect Robert Perry, it was introduced in 1973. The success of several Valiant 40s competing in long ocean races during the early 1980s brought this boat to the notice of the world sailing community. Draft of 6 feet is a little deep for our sailing in eastern Lake Erie and the east coast of the U.S.. I admit, I'm a gunkholer. However, I think that the Valiant 40 is available in a shoal draft version now. LOA . . 39� 10 3/4"
LWL . . . 34� 0"
Bruce Roberts 35 A (aft cockpit) from mild steel. This boat is my ultimate offshore cruiser. Mild steel, long fin keel, skeg mounted rudder. Note the similarity of this design to the Crealock 34 and 37 shown above. I am finishing one of these in my back yard at this time. The hull, deck, mast, rigging, and engine are completed. I'm now working on the interior. As you can see by the line drawing on the right, I've extended the back of the cabintop by 14 inches. This shortens the cockpit but adds interior space to the main salon. The cockpit is still long enough fo a large person to take a comfortable nap. This style of hull has tremendous strength and the fin keel offers good windward ability. The steel hull will absorb shock and bend with impact where fiberglass would crush and tear. This makes me feel much better when sailing at night when it's possible to hit a partially submerged object such as a floating log. Draft: 5 ft. 6 in. This hull/deck is now for sale. SOLD! 08/07/2010 The hull, deck, is complete, an Atomic 4 inboard engine is installed. The interior is not completed. I'm now 71 years old and would love to see someone finish it. I could make you a deal that couldn't be refused. I would sell this completed steel hull/deck for less than today's cost of the steel plate. If someone wants a boat building project, this would be a good one. The boat needs TLC but is solidly MIG welded steel for world cruising safety. Just email me at the bottom of most of my pages at go2erie@sssnet.com . Please put "Roberts 35 question" as the subject so that I don't miss your email. I said earlier that most of these boats have sailed every ocean in the world, and they have. Myself, I prefer a skeg mounted rudder on any boat that I take offshore. A skeg mounted rudder will take a lot more pounding than a spade. When a spade rudder breaks, it is usually gone. This makes it hard to jury rig. I know, spade rudders have circled the world, many times singlehanded. Still, offshore, give me a steel hull and deck and a skeg mounted rudder (see the Roberts 34 above). I was in an offshore storm. We were in an Endeavor 37, heading from Nassau thru the Tongue of the Ocean, to Chub Cay. The blow lasted more than 30 hours. We were lucky and finally managed to make shelter behind Whale Cay, a small horseshoe shaped island. Others were not so lucky. Even back then, when I was younger and carefree, I worried about the boat's hull. We had an Avon life raft but getting it inflated and everyone into it is something I don't even want to think about. Now, 33 years later, maybe the storm wasn't as bad as I thought. But also, even now, I know that a hull, deck or rudder failure would have been catastrophic. But all went well, the only major damage was a torn mainsail. For this reason an Endeavor 37 will be included in this review. That Endeavor took a terrific pounding during that blow and never even whimpered. This, of course, is a snapshot of my present boat, still under construction. She's a hearty ol girl, with most of the modern conveniences of home. The path, of course, leads to the outdoor head. All she needs is a good coat of paint and she'll be ready for a world cruise. As you can see by the photo, I have already started setting sail. I'll be ready when the tide comes in. Just click here to return to our MAIN INDEX page, from there go to my family history, my herbal cures, Old Cal Yachts page, more. Click here to go directly to My Old Cal Yacht webpage. Click here to see the specs on over 100 sailboats. This page was last modified on 9/16/2014.